I make! 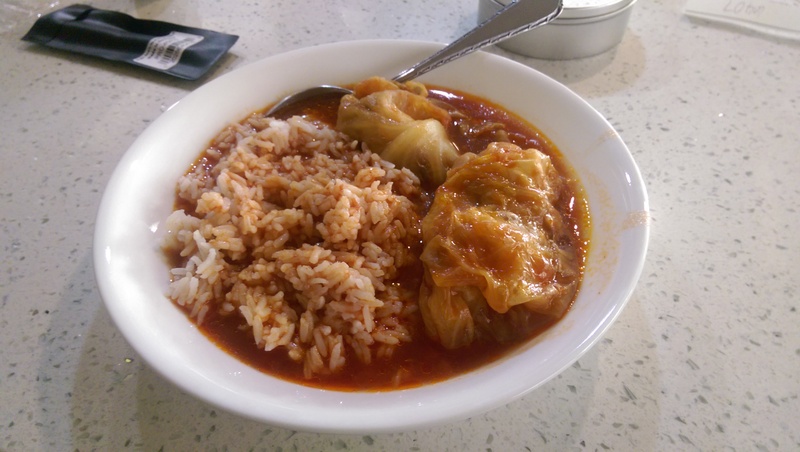 Garbage stuffed cabbage rolls edition | Random moosages as I see fit. I’ve made these several times now, so I thought I might post about them. You know how sometimes you look in your freezer and you see this random bag ground meat? And it might be labeled something like “ground pork”? And then you defrost it, thinking you can make something with ground pork and then realize that actually, it’s dumpling filling, as in, it’s ground pork already seasoned with sesame oil, soy sauce, ginger, and green onions? No? Well, it happens to me. Because…my mother. So, I take careful inventory of my freezer, fridge, and pantry because I’m not a fan of wasting food. I mean, yeah it happens, but I try not to let it happen. 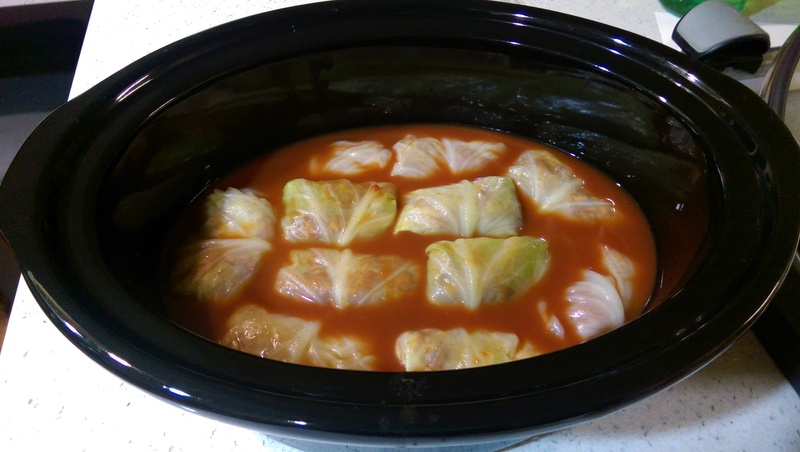 So when I came across the bag of ground pork and also had a cabbage on hand and also had all these cans of tomato paste to get rid of, I decided to make stuffed cabbage. I say stuffed cabbage instead of sarma or golumpki or holubky, etc because I’m taking whatever I find in my fridge/freezer and stuffing them into cabbage leaves and then cooking them in a tomato based sauce. It’s something inspired by the various regional dishes, but it really can’t be considered part of any one regional cuisine. They’re garbage stuffed cabbage rolls. This is just a way for me to get rid of food in a way that most people I know will eat. So, when I realized the bag labeled “ground pork” wasn’t just ground pork but prepared ground pork, I went ahead anyway. It turns out that what are essentially low carb dumplings in tomato soup are delicious. I can also say that when you replace the prepared ground pork with what were supposed to be hamburger patties seasoned with hickory BBQ sauce and bacon and stuff that into cabbage leaves, the results are also quite delicious. Random ground meat mixed with leftover rice, onion, and garlic, and other seasonings is pretty good too. My sauce, really soup, is the only thing that hasn’t changed much throughout all of my experiments stuffing things into cabbage leaves. Mostly because I’m also using this time to try and get rid of this giant box of tomato paste my mother brought home once. I’ll mix a 6oz can of tomato paste with approximately 4 cups of chicken stock and then add Worcestershire sauce, soy sauce, and sugar to taste and essentially poach the rolls in the soup, normally in the slow cooker.